A performance of “Fast Friends” at Woodwalk Gallery. Submitted photo. 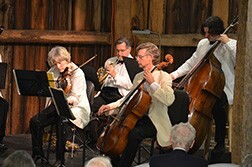 The Hardy Gallery provided a perfect setting for the June 19 Midsummer’s Music Festival concert; display panels of art moved to create a performance space in the rustic venue known for its excellent acoustics. Outside, the waters of Eagle Harbor and the colors of the fading sun provided a fitting backdrop for the romantic music of the featured composers. Franz Lachner and Franz Schubert were good friends with more than their first names in common, James Berkenstock explained in his introduction. They were Viennese and were not only partners in music, but were drinking buddies as well. The program began with Lachner’s Nonet in F Major for winds and strings. One of the delights of chamber music is that individual voices of the instruments are distinctly heard, in this case the violin, viola, cello, and string bass, along with those of the flute, oboe, clarinet, bassoon and French horn. But at the same time, the larger instrumentation offers a fuller, more complex sound that envelops the audience. The second and final piece, the Schubert Octet in F Major, paralleled the first with a similar orchestration, this time two violins, viola, cello, string bass, and clarinet, bassoon, and horn, and with the same effect of clear individual instrumental voices in conversation but within a rich communal chorus. The four movements of the nonet alternated slow sections, at times somber and plaintive, with those brighter and more exuberant. The inclusion of Lachner in the concert is characteristic of Berkenstock’s programming, offering the works of lesser known composers as well as the familiar names, giving the audience the opportunity to hear sometimes more obscure work and to find unexpected enjoyment. The artistic director’s spoken comments, along with his program notes, provide engaging music history for concertgoers. Schubert’s octet might loosely be classified as a divertimenti, Berkenstock explained. The form was popular during the earlier century and characterized by more movements (in this instance, six) that usually include two dance sections and another, a theme and variation (here two of them), with the composer’s overall intent to amuse through a lightness in spirit. Especially enjoyable in this piece were the soulful instrumental arias of the second movement, the lively comic dance of the third, and the drama of the final andante. One inevitable result of pairing the two friends, one more famous than the other, is that even a casual listener can hear why the genius of one has achieved more fame. Each season Midsummer’s Music brings ensembles of talented musicians to various venues in Northern Door, but violinist David Perry might be singled out as exceptional among them. He is first violinist of the Pro Arte Quartet as well as artist-in-residence and professor of violin at the University of Wisconsin School of Music. Observing while listening to him play is always a sensory delight. The walk along the Hardy Gallery pier with dark overcast skies and the deep rippling hues of the waters of Green Bay was a perfect complement to the evening’s sampling of romantic music from the 19th century. Midsummer’s Music runs through July 14, and resumes Aug. 28 through Sept. 7. For tickets call 920.854.7088 or visit midsummersmusic.com.